Christmas with Cricut + GIVEAWAY! I love Christmas. Like, seriously, LOVE Christmas. Whether it’s the extra time with family, the festivities, the decor, or the fact that it is acceptable to have every surface covered in glitter….I love Christmas, and Christmas decor in particular. If you follow me on Instagram, you may have seen that I won a Cricut at Blogpodium back in September, and I was more than a bit excited about it! I’ve decided that it’s going to be a Cricut Christmas, and I’m going to integrate as much Cricut as I can into gifts, decor and gift wrapping! (And no, this totally isn’t a sponsored post, I am seriously just amazed by what a Cricut can do!) I’m pretty sure you will be amazed as well. I’ve teamed up with some other Cricut-obsessed bloggers to show just how awesome a Cricut is, especially for the holidays. 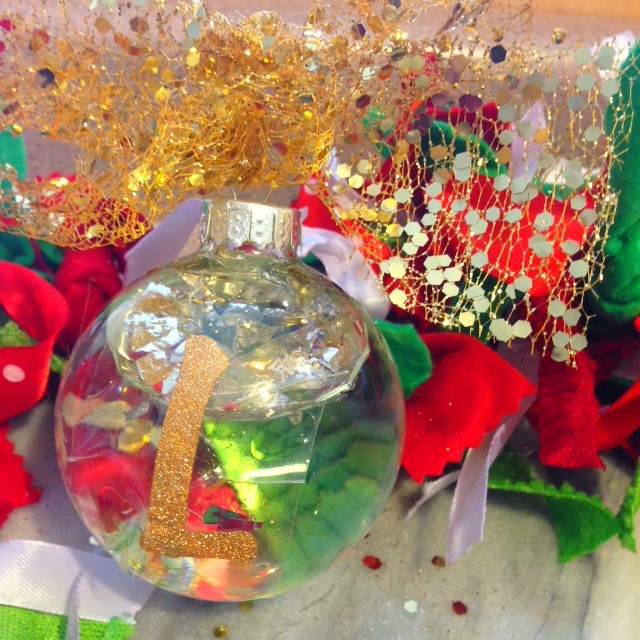 We all made Christmas ornaments with our Cricuts, and I think you’re going to LOVE them! I used my Cricut to cut out letters on the glitter vinyl adhesive – I started out by doing Lily’s entire name but ended up liking the look of just the L – pretty and simple. 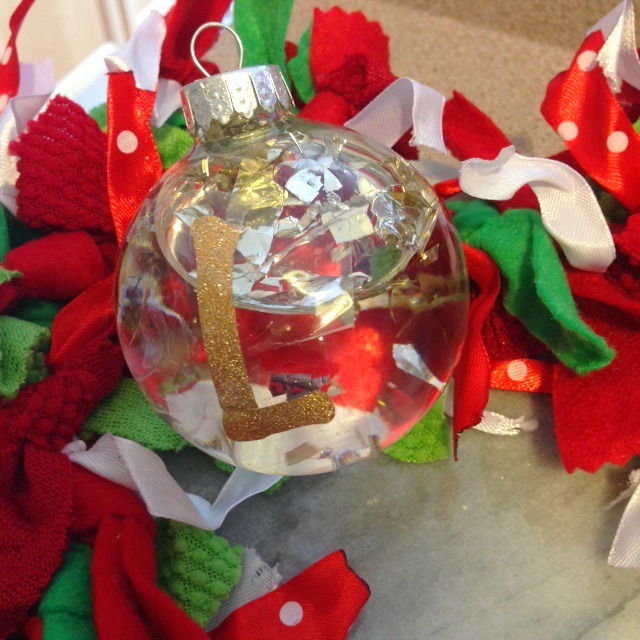 Now – learn from my mistakes and fill the ornament BEFORE you put the vinyl letter on! 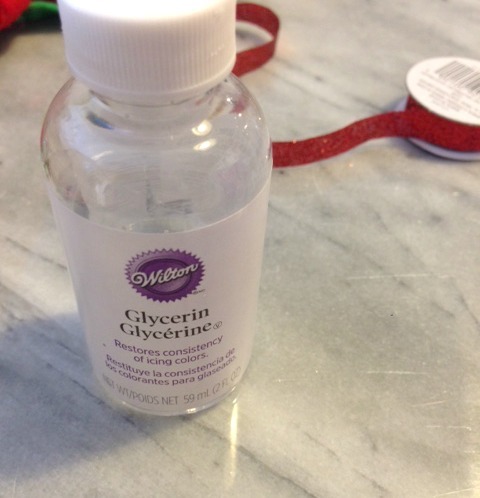 I put the water and the glycerin in a cup and mixed it up well before putting it in the ornament – I’ve been told that the glycerin makes the glitter/confetti float down slower and it seemed to work in mine. Pop off the top of your ornament and carefully pour the water in. Add the glitter afterwards (put in what you think you need and then add a little bit!). Don’t you love my completely precise instructions? Pop the top back on and wipe the exterior of the ornament well. I used Krazy Glue to seal the top of the ornament to prevent leakage. I let it sit for about an hour to let it dry and seal. Then you can just peel your letter (or name, whatever you prefer!) and stick it on the exterior of the ornament! Just make sure it’s really dry so it will stick. You can use transfer paper if you’re doing an entire name to keep it neat, but I just used tweezers to place the letter. Annnnnnd because I can’t get enough glitter in one project, I topped the ornament with a glittery gold bow! Now – I’ll be completely honest. This ornament really doesn’t photograph well…I’m sure a professional photographer would be able to get a great shot, but with the floating sparklies inside sinking and settling, and the glare off the the metallic, it doesn’t translate the best. But…you get the idea! I can’t wait to make even more Christmas goodies with my Cricut! If you have done any awesome Christmas projects with your Cricut, please share below, I would love to see them – I’m a Cricut newbie! Now on to the part that I’m most excited about! I’ve teamed up with a group of awesome Cricut-loving bloggers to give away a mint green Cricut Explore Air 2. This contest is open to US and Canadian residents, and one winner will be selected randomly from the widget below. Now that you’ve seen what the Cricut can do, it’s time to enter to win your own Cricut Explore Air 2! Now it’s time to check out the other great Christmas Cricut Ornaments from my Canadian blogging friends! This entry was posted in DIY, Giveaways, Home and tagged Christmas, Cricut, diy, Ornament. I’d love to make greeting cards! Ahhh! I love these. I have an weird addiction to snow globes so this is kind of amazing. I love scrapbooking so, I would use the Cricut to continue to create my memories! I would love to win one of these! I’ve seen so many amazing creations that I’d love to make myself! What a cute idea, and love the personal monogram. I love the idea to put glycerin in these! So fun! And I love all the sparkles!! OMG – The inner crafter in me would die to have this! Awesome! What a neat idea! I’ve always loved the possibilities available with a Cricut, but I’m so uncrafty it’s silly! Would love to finally give it a try. Love the idea of the snow globe ornaments, so pretty! I would make ornaments like yours! I would love to make my own pattern of paper with this. Have always been intrigued by a Cricut would love to win this!! 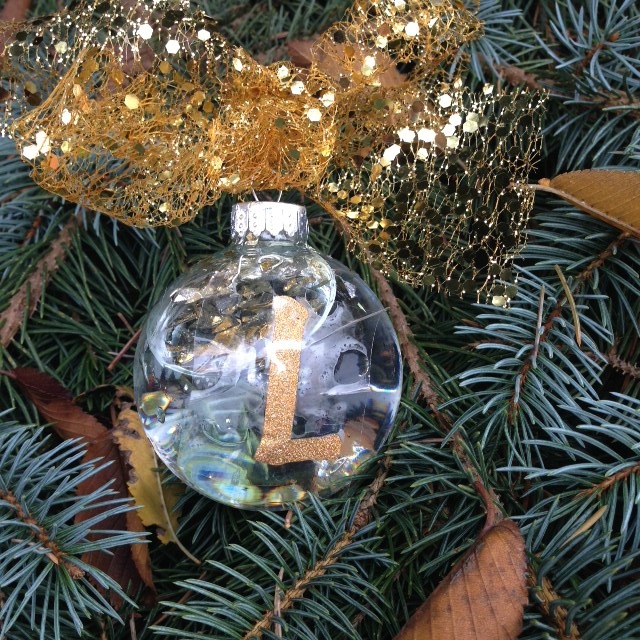 The glitter vinyl L’s are lovely!! I would love to try and make snow globes. I love them and try to buy one on every vacation we go on for each of our kids. I love the Christmas spirit, these are so adorable! This would be SO much fun to play with! I love Christmas too! Been counting down since 101 days before Christmas! You have a lot of lovely ideas and posts!! Thanks!! I would love to make my own holiday cards with pop ups. I am so excited to make my own ornaments as my mother always added our own little touches as we grew up. The mini deer ornament is right up my alley.